Recently, I was sent a raw chocolate making kit from Indigo Herbs, together with a heap of other raw ingredients so I could get creative and have a go at making my own raw chocolates. Indigo Herbs is a company devoted to “empowering optimum health and nutrition”. Appropriately, it is based in the capital of all things alternative, Glastonbury. Amongst the more familiar packs of goji berries and coconut chips. I found one of white mulberries and one of banana powder. I’ve not tried either of these before and didn’t even know there was such a thing as banana powder, so I was immediately intrigued. I was pleased to see that everything save the goji berries was organic which always gets a big thumbs up from me. I used the coconut chips straight away to decorate my free from cake. I have had a go at making raw chocolates a couple of times and have had mixed results. They have always tasted good, but I found that the liquid had a tendency to separate and seep out of the finished product. The secret, according to the instructions accompanying this Indigo Herbs chocolate kit, was to stir the liquid chocolate at least a hundred times. The kit was a 750g bag containing organic cacao powder, organic cacao butter, organic agave syrup and pure vanilla powder. The cacao powder was Peruvian Criolla which is said to be the best quality of cacao there is. Out of interest, I compared it to some other raw cocoa powder I happened to have in the cupboard. The Criolla smelt richer and sweeter and had a darker colour. It tasted richer and fruitier too. Normally sold at £25.99, the kit is currently on offer at £23.99. Excited, as I always am by chocolate, I set to work. I say work, but really there isn’t a great deal of it involved, a more appropriate word is fun. Raw chocolate making is a lot easier than “normal” chocolate making – there is no tempering required. It’s just a case of melting cocoa butter and stirring in the other ingredients – that’s the theory anyway. I decided to make up a batch of plain raw chocolate and divide it into four. One quarter I would use to make simple raw chocolates, to one quarter I wanted to add lacuma powder and dried white mulberries, to another some dried banana powder and to another banana powder and Brazil nuts. The scent of melted chocolate wafting around the kitchen made the “work” quite delightful. Melted 100g cacao butter in a glass bowl over top a pan of barely simmering water, ensuring the water didn’t touch the bottom. As soon as the butter had melted, stirred in 3g of vanilla powder (1 teaspoon). Stirred in 100g cacao powder and kept stirring until the mixture was smooth with no lumps remaining. Stirred in 100ml agave syrup and kept on stirring until smooth and glossy and properly mixed (over 100 stirs). At this point I spooned about 1/4 of the mixture into button and spoon moulds banging the filled moulds on the counter to ensure the mixture was level and air bubbles removed. Left in a cool place to set. Added 1 tsp of lacuma powder to the remaining mixture and stirred. Spooned a little into the bottom of some strawberry moulds. Added a few dried mulberries, then spooned some more mixture over the top to fill the moulds. Added 1/2 tsp of banana powder to the remaining mixture and gave another good stir. At this point the mixture went a little strange and became quite thick and difficult to work with. Chopped 4 Brazil nuts and laid at the bottom of some strawberry moulds. Spooned some of the mixture on top. Spooned the rest into shell moulds and left to set. The plain chocolates were quite fragile and I managed to break a few of them when releasing them from their moulds. They were simultaneously shiny and powdery which was a bit odd. I was pleased with the shine, but less so with the powdering. Luckily they tasted really good. I’ve not made any with vanilla powder before and this gave an added dimension to their flavour. The buttons, when placed on the tongue, melted delightfully. I couldn’t resist chewing on the spoons though. The mulberry chocolates in the strawberry moulds were the most successful and also my favourite when it came to eating them. The banana flavour of the shell chocolates was subtle, but noticeable. It was just about right for both CT and I who don’t like strong banana flavours. But I guess more powder could be added for those that do. I’d assumed that adding powder would make the mixture more stable, but the cocoa butter separated out a little and the chocolates were not only dull but streaky. Although by no means perfect, this was by far and away the best results I’ve had with making raw chocolate so far. The accompanying instructions were clear and simple. I’m looking forward to my next attempt and to further experimentation. I’d also like to have a go at making some chocolate energy bars. When I asked Indigo Herbs how to stop the white streaks and make my mixture more stable, they suggested popping the chocolates into the freezer as soon as they were in the moulds. To be fair the instructions did say this, but I never have any room in my freezer, so I omitted this bit. I will make sure I find some room the next time I have a go and see what difference that makes. The freezing option might also mean the chocolates can be more easily released from the moulds, thus omitting breakages*. My box of goodies included a fresh mango and some bananas. On seeing these, I had a mad idea of dipping slices of fresh fruit into the liquid chocolate and eating it warm and dripping as in a chocolate fondue. But before going completely “bananas”, I wanted to try making the real thing first. So, the fruit went into this raw tropical smoothie along with some of the raw cocoa powder. I was so pleased I did this as it was utterly delicious. The box included a plastic smoothie maker, but I have to confess I couldn’t figure out how this worked, so resorted to my electric blender. * After writing this, I tried another batch of raw chocolate using the freezer method. I went for the basic recipe, only adding the vanilla as flavouring as instructed. It worked much better this time. The chocolates were shiny, came out of their moulds unscathed and there was no powdering. There were also fewer air bubbles as I banged the mixture down on the bench more vigorously second time around. I added mulberries to some chocolates and Brazil nuts to others. I was sufficiently confident in their quality to give them as a thank you present. sounds amazing. I’ve always read with “traditional” chocolate making that you shouldn’t put it in the freezer, but it seems to have worked a treat with the raw chocolate. I can see us giving this a go in the near future! Yes, raw chocolate is quite a different beast I’m finding. Wow, this looks amazing! I would love to have a play around with this! Oh lucky you Karen. I think they are my favourite chocolate moulds. Such a fun recipe and I love your moulds! I really enjoyed reading this post! Thanks LL – just wish I had more time in the day and I would play around with this quite a lot more. Oh what fun. Your choccie buttons look cute as pie Choclette! I’m very intrigued by raw chocolate too, but have yet to experiment. Lots of good tips here, a lovely post. Thank you Lou – raw chocolate behaves in a very different way to “normal” chocolate, but you can produce good results with relative ease. Very cute! And I know what you mean about the smell of chocolate – it’s really wonderful isn’t it! Well done on your second batch working well and having a lovely shine. I’ve tried raw chocolate once and really didn’t like it as there was no ‘snap’ and it tasted like cooking chocolate to me. Might not have been the best, so I reserve judgement. Thanks Janice. There is no doubt that raw chocolate tastes and behaves very differently to tempered chocolate, but as long as I know it’s going to be different, I quite like it. Even though I’m such a massive fan of traditional not very good for you chocolate you have made me really want to try raw chocolate now. Does this mean I can eat more of it if it is better for me?! I adore those button-shapped buttons… how cute are they? Love the tips with the freezer and love that you clearly had so much fun doing this! Those buttons are super cute Dom, but fiddly to get in and out of the moulds. How adorable are those chocolate buttons! Thanks Angie, they are very cute. A good friend of mine owns a health food store and has sold raw chocolate ever since they opened- she tells me sales over the past couple of years have rocketed enormously and they’ve launched extremely successful raw chocolate workshops now. Oh that’s interesting Kate. I have noticed a big increase in the number of brands now offered in health food shops. Would love to go on a workshop. Raw is definitely a growing trend! 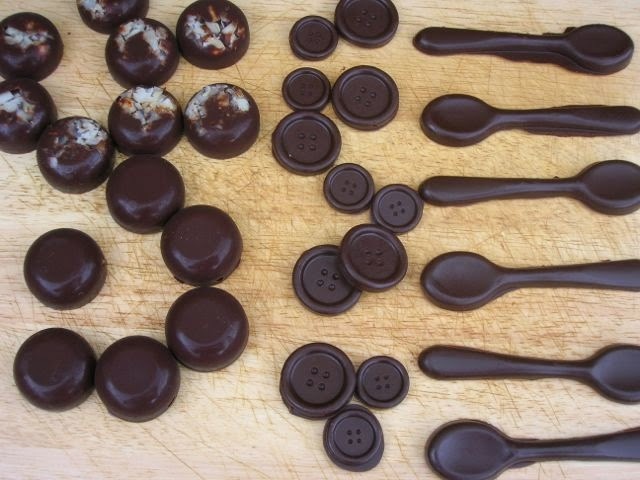 I love the fun moulds you have used, especially the buttons…… Fascinating how they come out so much better in the freezer…… seems to be completely the opposite to usual chocolate! Thanks Kate, the buttons are really cute, but they are a bit fiddly to use. And yes, it has quite different properties to “normal” chocolate – you wouldn’t want to put that anywhere near the freezer or even fridge. I found that when I used agave syrup it actually kind of beaded within the chocolate. That is, I found extremely small but identifiable little tiny droplets of agave syrup within the chocolate all the way through. Did you find the same at all? I’m just curious as I used a deeper mold so maybe it was because it took longer to set or something..?